This sign appears to be old. We were unable to date this sign, but it is clear that it would have been used in a foreign setting. The sign has a large illustration of the Great Spinx on the front. 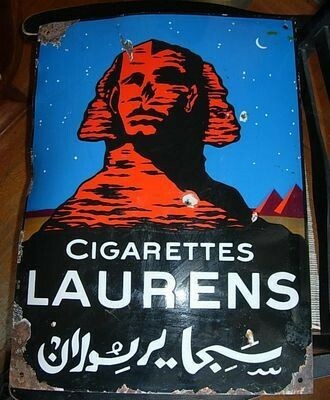 The Spinx is in red and below the Spinx is text that reads “Cigarettes Laurens” with ineligible text below. The sign is a single sided porcelain sign.